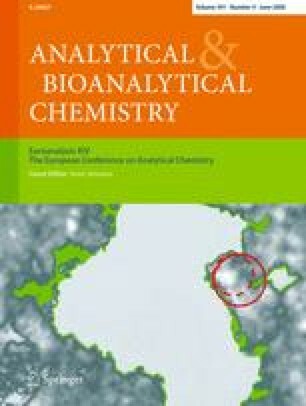 A detailed investigation into the functional groups responsible for the formation of a noncovalent complex between 2-aminopyridine (template) and methacrylic acid (functional monomer) has been carried out using FTIR spectroscopy and confirmed by 1H NMR spectroscopic data. The approach adopted to confirm the mechanism of interaction was the analysis of the template plus the structurally similar 2-methylaminopyridine and 2-dimethylaminopyridine. A 1:1 stoichiometry of complexation was determined by Job plot analysis following titration, with FTIR results complementing those of the 1H NMR study. The strength of interaction between 2-aminopyridine and the functional monomer measured through band shifts by FTIR spectroscopy was compared with such interactions for the isomers 3- and 4-aminopyridine. This comparison identified a clear correlation between template pK a, degree of interaction and subsequent nonspecific binding in the nonimprinted polymer. Using FTIR spectroscopy it was also possible to observe the effect of temperature on the prepolymerisation solution. IR spectra showed that lower temperatures led to more stabilized interactions of the hydrogen-bonded complex. The potential advantages of FTIR spectroscopy compared with 1H NMR spectroscopy in studying prepolymerisation solutions have been identified. This is a preview of subscription content, log in to check access. The author gratefully acknowledges the support from the Irish Research Council for Science, Engineering and Technology (IRCSET) under the Embark Initiative. Part of this work is also supported by the European Regional Development Fund (ERDF) INTERREG IIIA Ireland/Wales Programme 2000–2006, under the SWINGS project. © 2018 Springer Nature Switzerland AG. Part of Springer Nature.